So you are thinking of building a new home? Home >> Guest Blogs >> So you are thinking of building a new home? Posted by James Hunter in Guest Blogs | Comments Off on So you are thinking of building a new home? Well let me start with an old saying ‘The greenest building is the building that doesn’t get built at all”… Strange to start off with I know, but this is because building a home will almost always degrade a site. So to avoid this, it is preferable not to start a new build at all by retrofitting. As not building anything at all or retrofitting an existing structure is not always a feasible or interesting option, the intention then is to build using sustainable, renewable methods to minimize the footprint you are making on the proposed site. This can be done by using recycled materials and renewable sources such as solar power or ‘green roofs’ to reduce water run off. This is basically planting grass or plants on your roof, it may look pretty and sound simple but it is a highly useful method to replace some of the green material that was removed in the building process. It is also pretty simple to do on a new build. For a building to be sustainable you would look to use renewable materials from local sources, like local timber or gravel. However, no matter how many of these materials are used, you still have the issue of the damage that the ground works have caused. Ground works involve making room for foundations to be placed, i.e. concrete bases for housing. More often than not it involves removing a substantial quantity of land to create a trench that will then be filled up with the desired materials. Now, concrete is a building material that always seems damaging in terms of our eco footprint. You may be surprised to know that aside from the actual process of making cement, concrete is one of the greenest construction materials around. If you have to wreak havoc to a piece of land, the least you can do is make it sustainable, and concrete does just that. 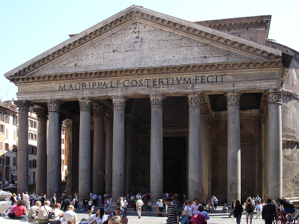 There are structures such as the Roman Pantheon that have been around since 200 AD and are still viable today. The benefit of concrete being that sources are almost always local so as well as travelling less miles from producer to consumer, it also supports local networks, a vital part of any eco driven project. 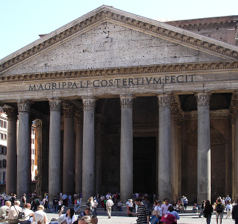 Using modern techniques, the overall impact of a structure can be reduced by altering the properties of concrete. One method is to create a permeable concrete. This involves pores in the concrete that allow water from multiple sources (rain, precipitation etc.) to be passed directly through the material into the ground. This in turn reduces the need for excess piping or tunnels to remove the water that would usually pool on the surface. Permeable concrete is often used for parking areas and flatworks such as pavements or even greenhouses. So if you want to lay a new driveway or set up a greenhouse, ask for permeable concrete to reduce your footprint. James Hunter is Managing Director of Readymix Concrete Online, an online concrete supplier in the UK.